Dockless scooters were posing a problem for those walking on the Texas State Capitol grounds. 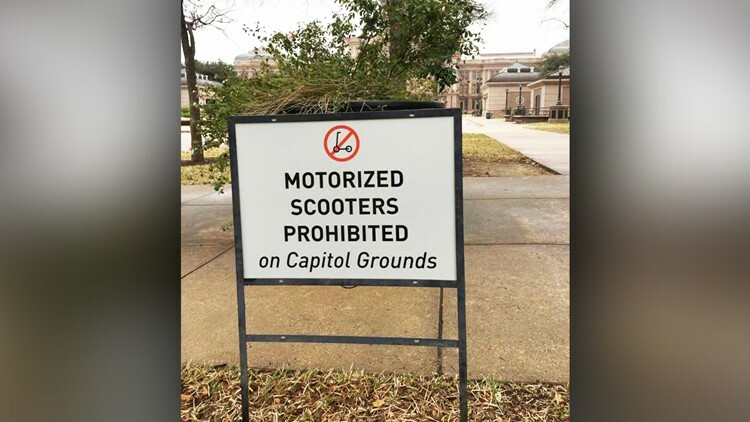 AUSTIN, Texas — With the Texas legislature in full swing now, dockless scooter riders should heed a rule on the grounds of the Texas State Capitol. Texas Capitol staffers complained about the the dockless scooters as early as December. They said the scooters zooming quickly on the grounds startle those walking. In recent months, there have been at least three instances where staffers have had their cars damaged by scooters. One staffer had both sides of his car damaged. Now, the session is fully underway, and signs scattered throughout the grounds are letting those scooter riders know that motorized vehicles are not welcome. Dockless scooters have been banned from the grounds of the Texas State Capitol. Motorized scooters were banned in the latter half of December, according to Chris Currens, the spokesperson for the Texas State Preservation Board. The agency said they banned them because of there were too many close calls, they were in the way of ADA accessible pathways and there were instances where they overtook pedestrians.